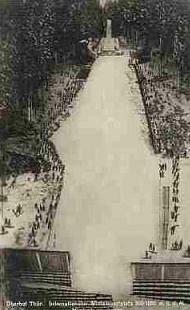 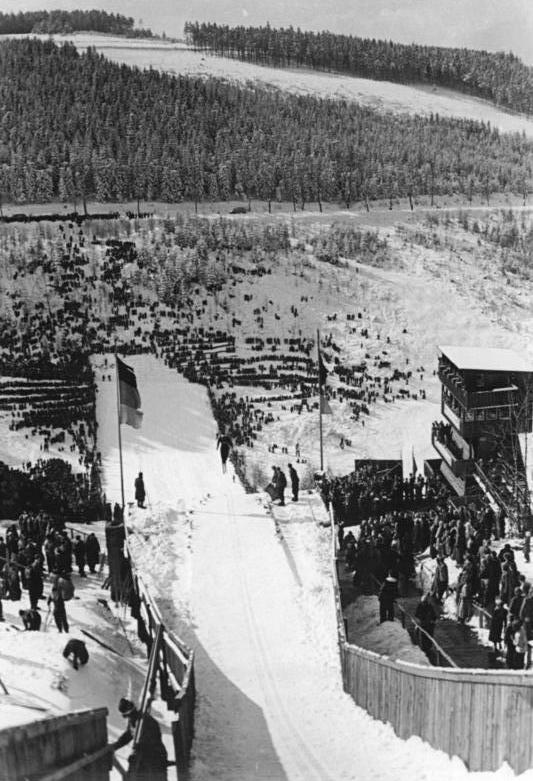 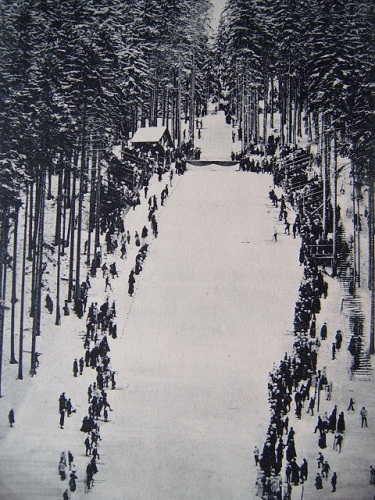 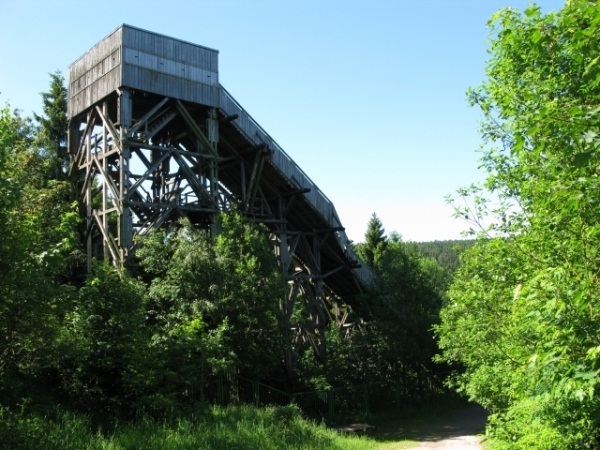 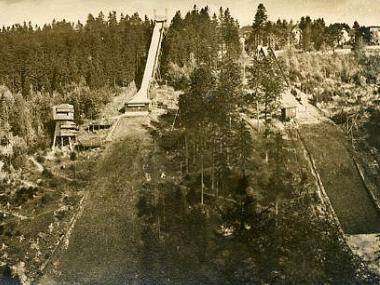 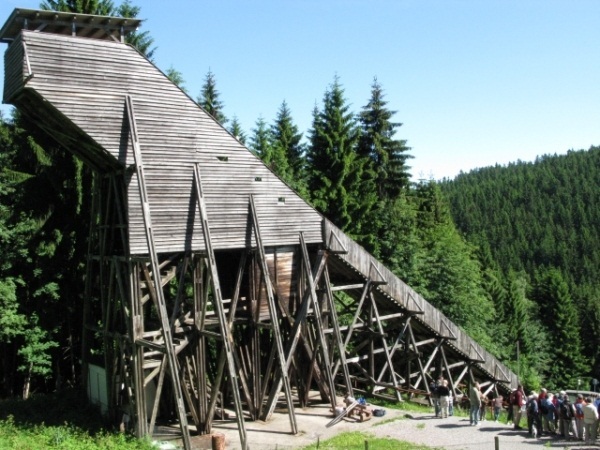 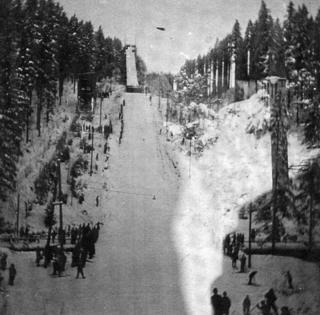 The very first jump in Oberhof was already built in 1906 at the Tambacher Straße, 1908 the ski jump at Wadeberg was constructed by Norway's Rolf W. Thune. 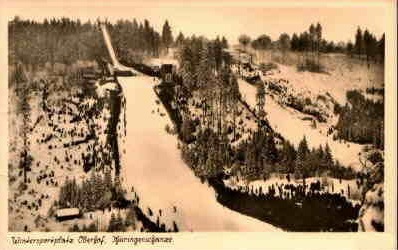 Numerous German and Thuringian Championships were held on the 25 meter hill with distances going up to 38 meters by end 1920's. 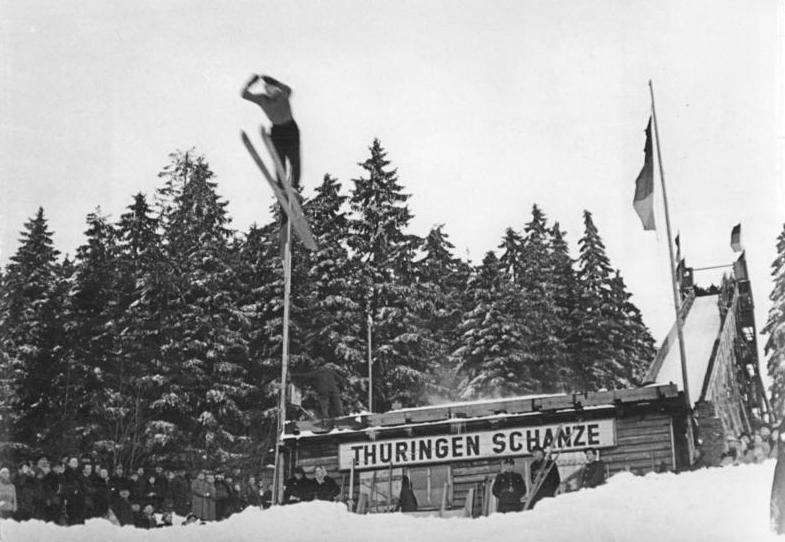 In 1928 the Thüringenschanze at Wadeberg was opened with an attendance of 30,000 spectators. 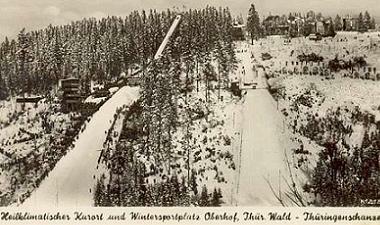 On 1931-02-16 the WSC competition of Nordic Ski Championships at Oberhof was hosted, winner was 19-year-old Birger Ruud. 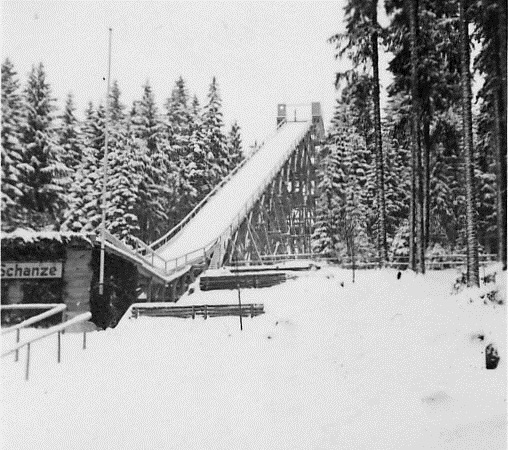 During NS time until 1945 the 70 meter ski jump had the name ”Hindenburgschanze” and was converted in 1937-38 for NS Winter Games. 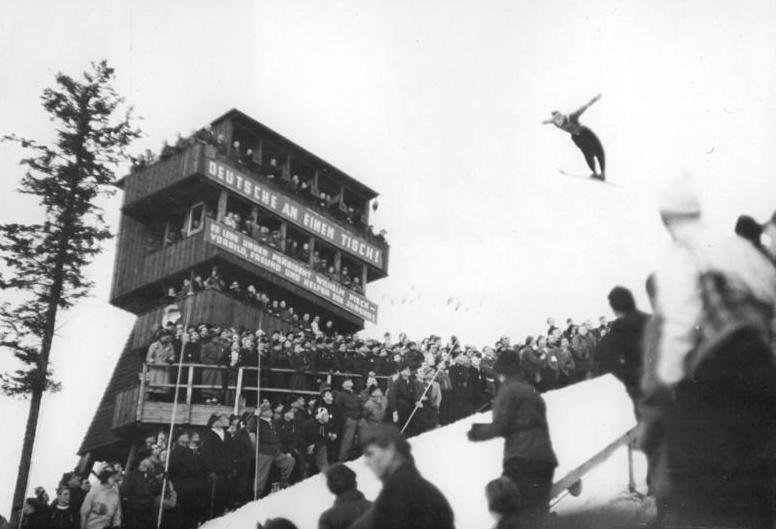 After World War II Thüringenschanze was restored in fall 1948 and in February 1949 the Championships of the Soviet occupation zone were held there. 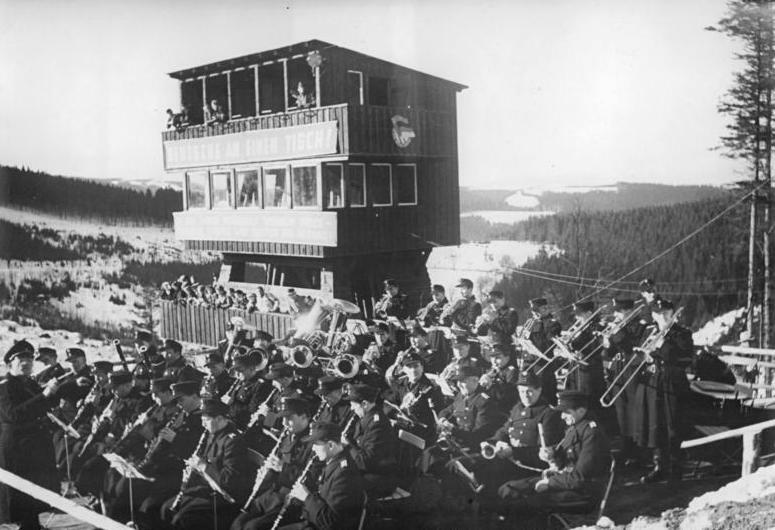 A fundamental modernization and the construction of the judges' tower took place in 1950-51. 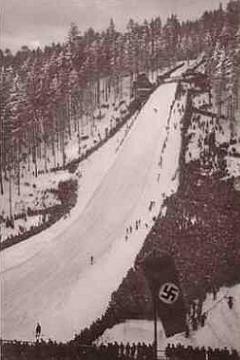 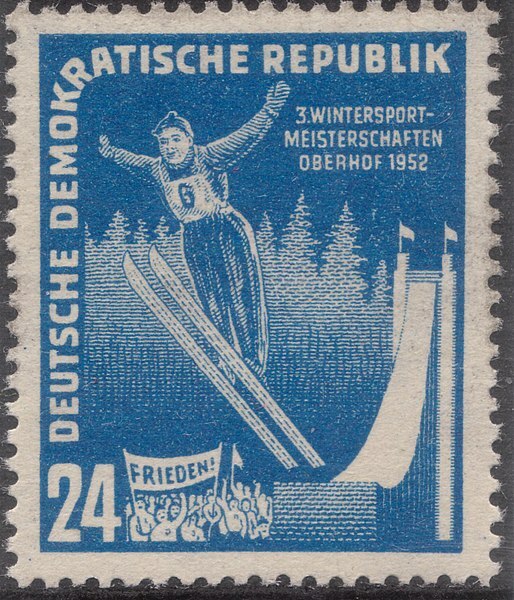 Then 120,000 spectators came to attend the GDR Championships at Oberhof in February 1951. 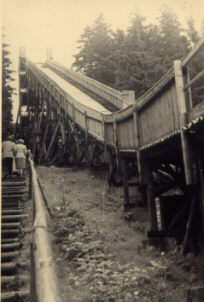 The 80 meter hill was covered with plastic mattings in 1955. 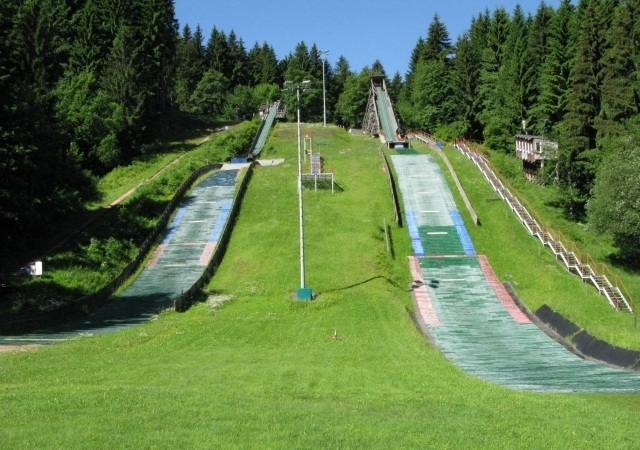 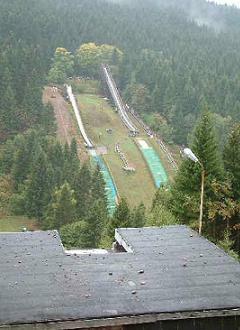 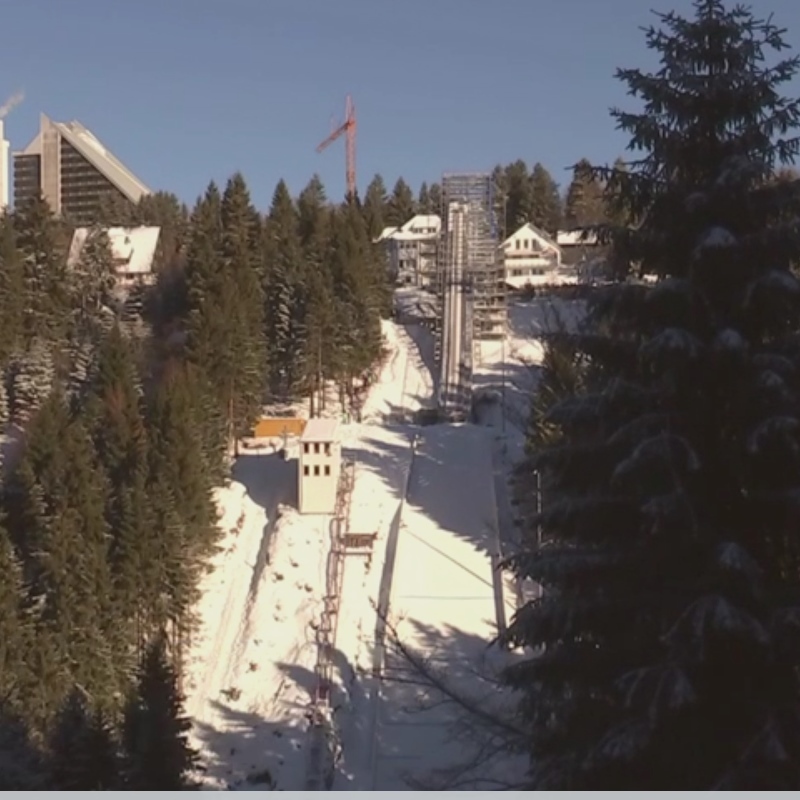 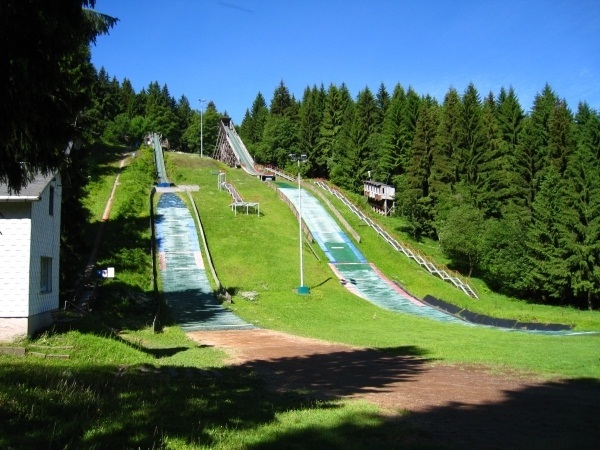 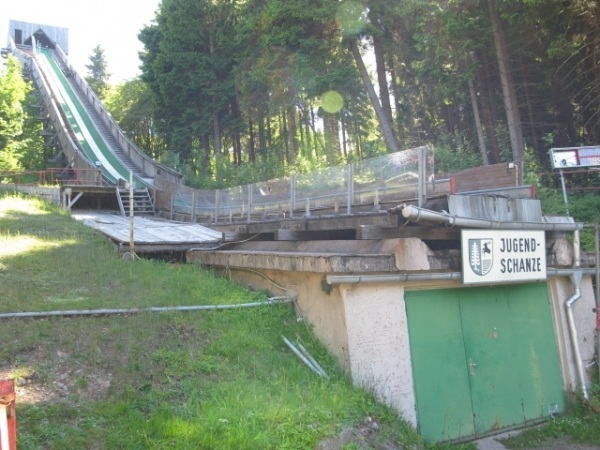 During this period a lot of international competitions were held there, but with the opening of the ski jump at Rennsteig in 1961 it was mainly used for training only. 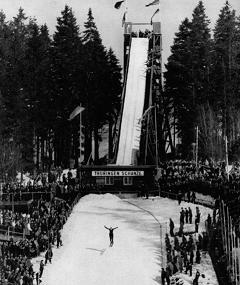 In February 1981 16-year-old Jens Weißflog from Oberwiesenthal jumped a last hill record of 83.5 m at the 15th ski festival of Oberhof. 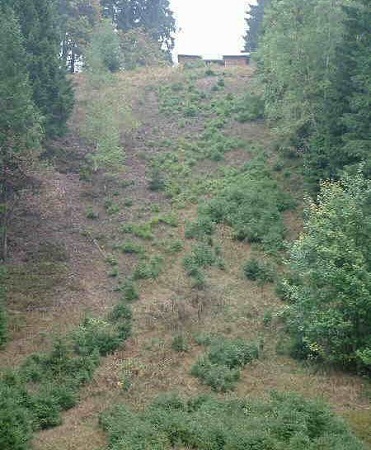 The inrun tower was removed in 1986 and today you can only see the dilapidated landing hill and take-off. 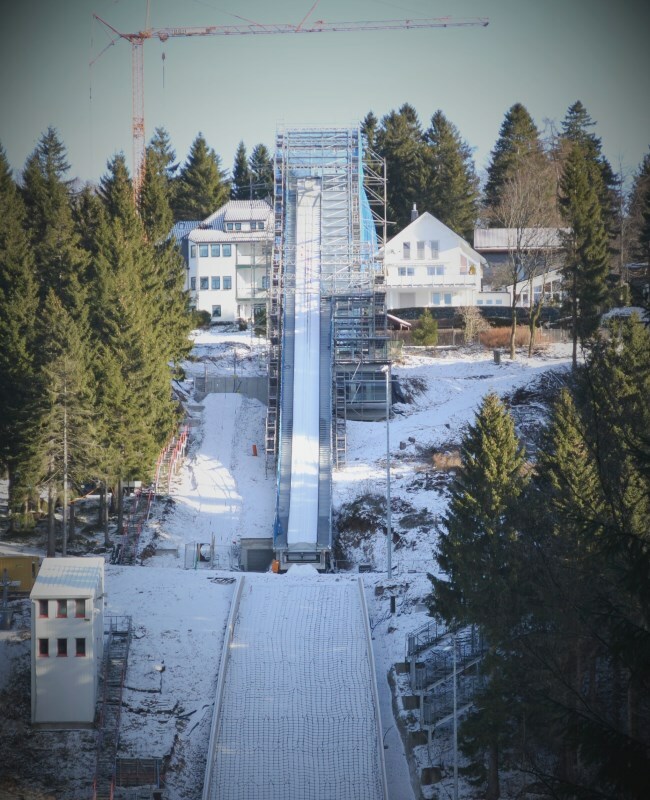 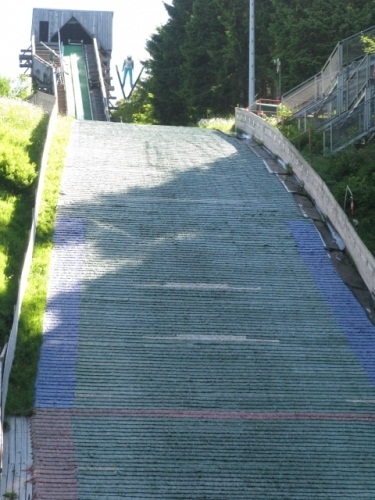 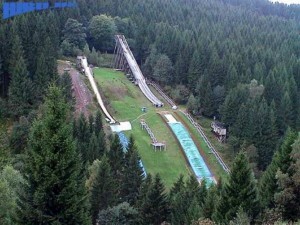 The 66-meter-Jugendschanze was constructed next to old Thüringenschanze from 1951 to 1952 and in 1954 it became the world's first plastic covered ski jumping hill. 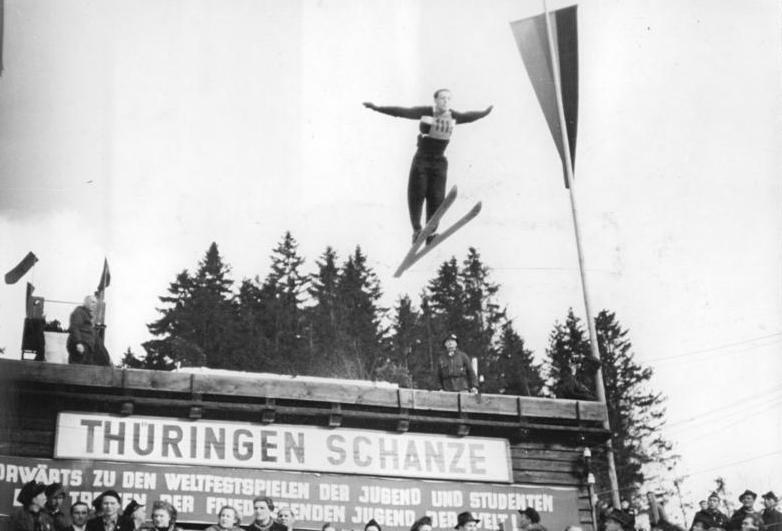 On 1954-11-20 Werner Lesser set the first record on mattings with 42 m. But before there was already an unofficial training on the old Regenbergschanze at Zella-Mehlis on 1954-10-31. 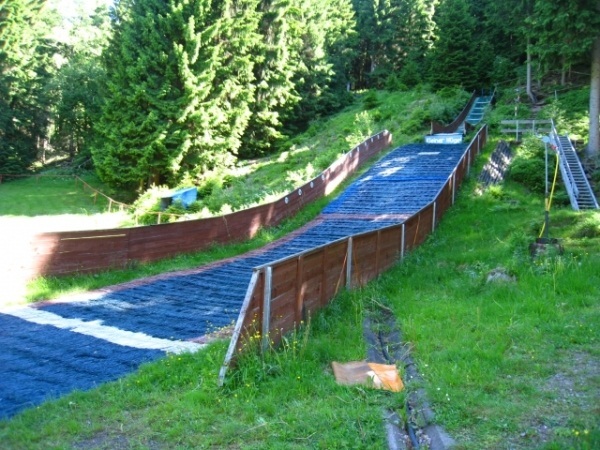 Inventor of plastic mattings was the GDR national coach Hans Renner, whose name was later given to the large hill at Oberhof. 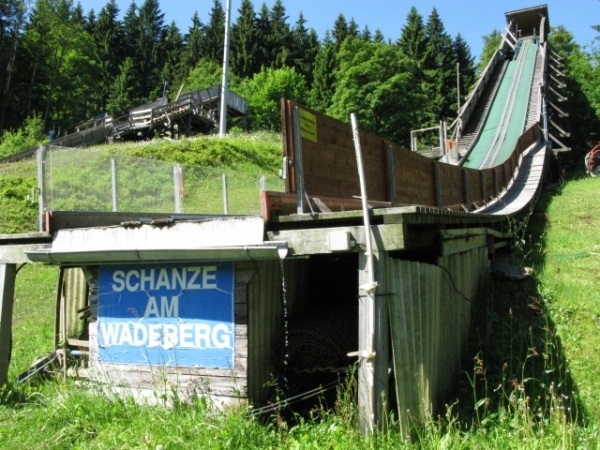 Conversions of the Wadebergschanze took place in 1988 and 1994. 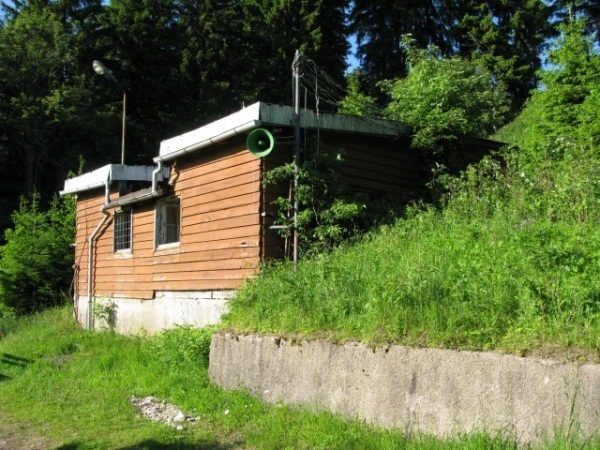 Opposite to the former Thüringenschanze the two plastic covered Schüler­schanzen K48 and K34 were situated, the Kinderschanze K13 was below it. 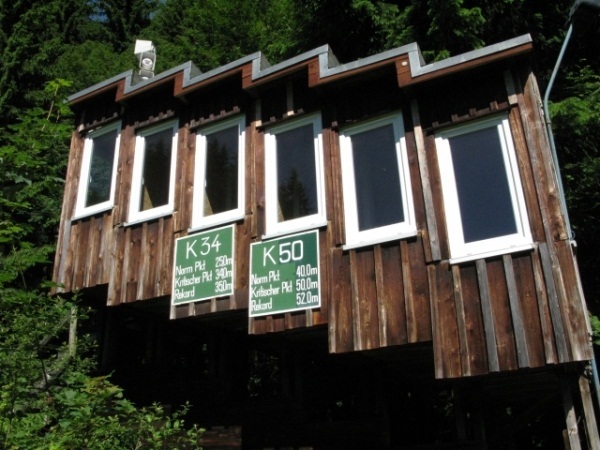 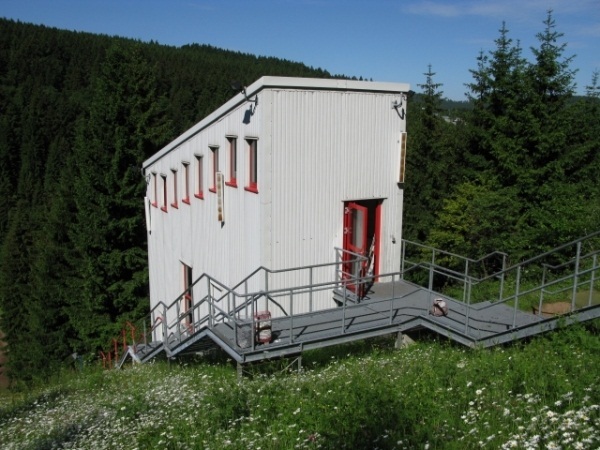 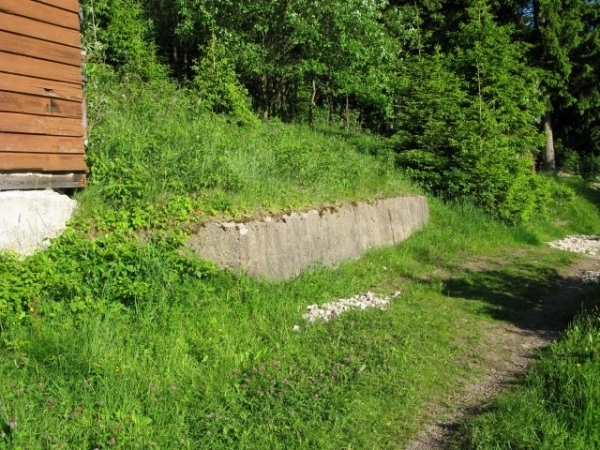 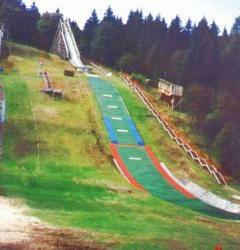 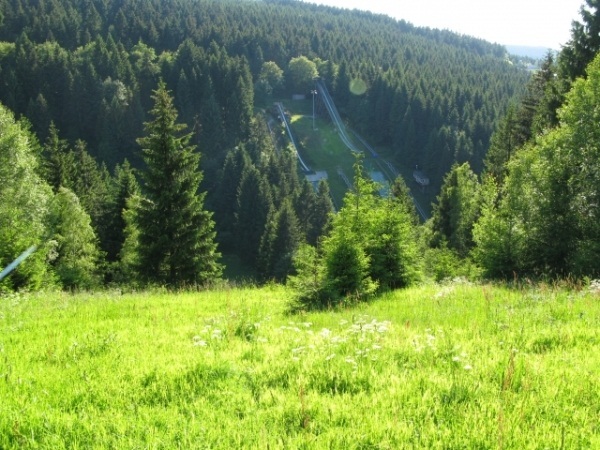 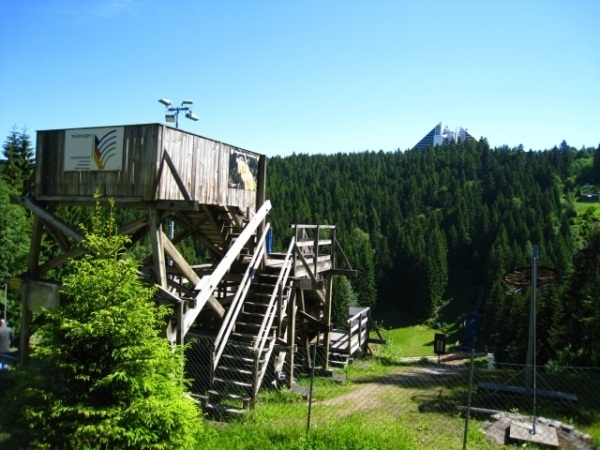 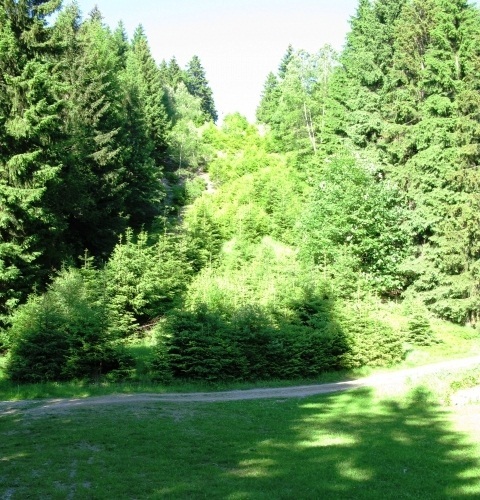 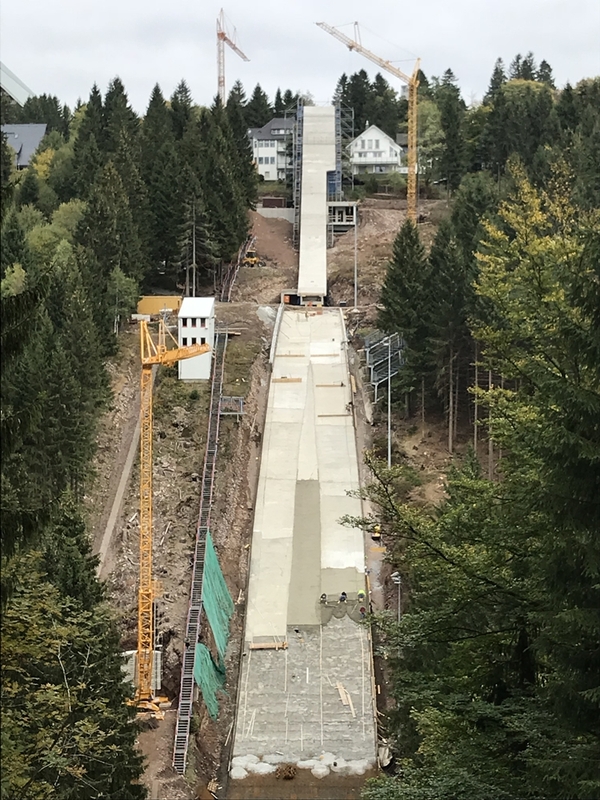 Furthermore, in November 2011 the planning of the construction of a new K80 (HS 85) ski jump at Wadeberg for around 2.5m Euro was started. 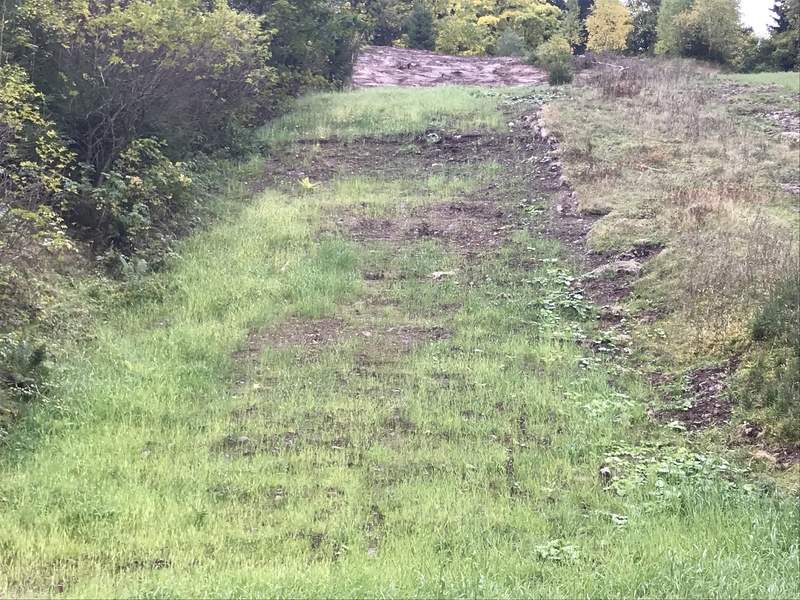 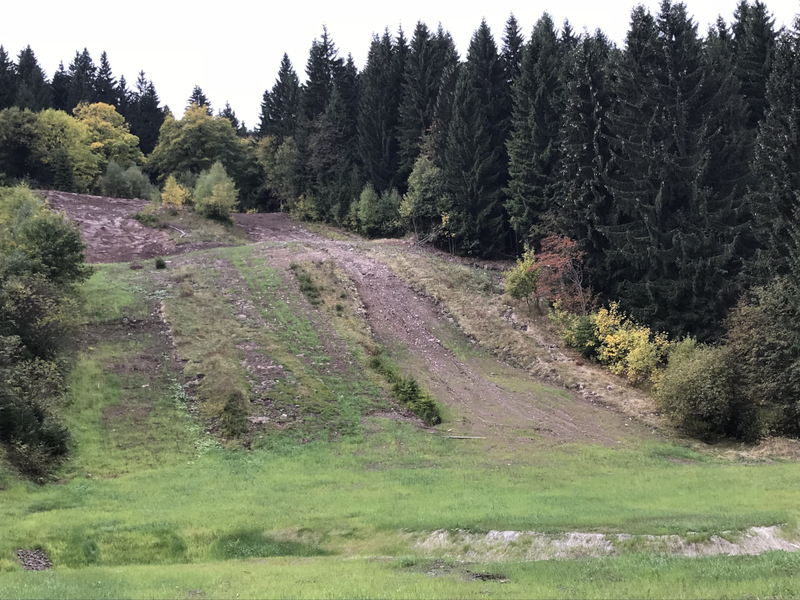 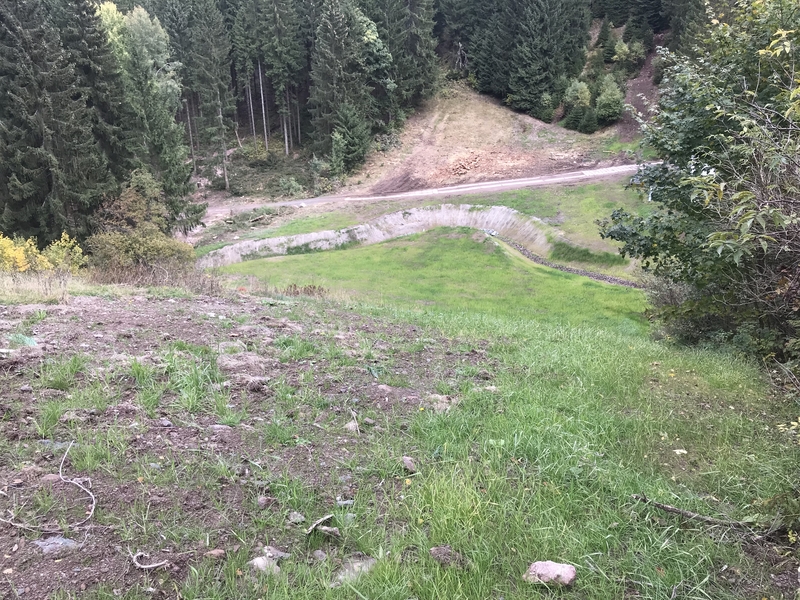 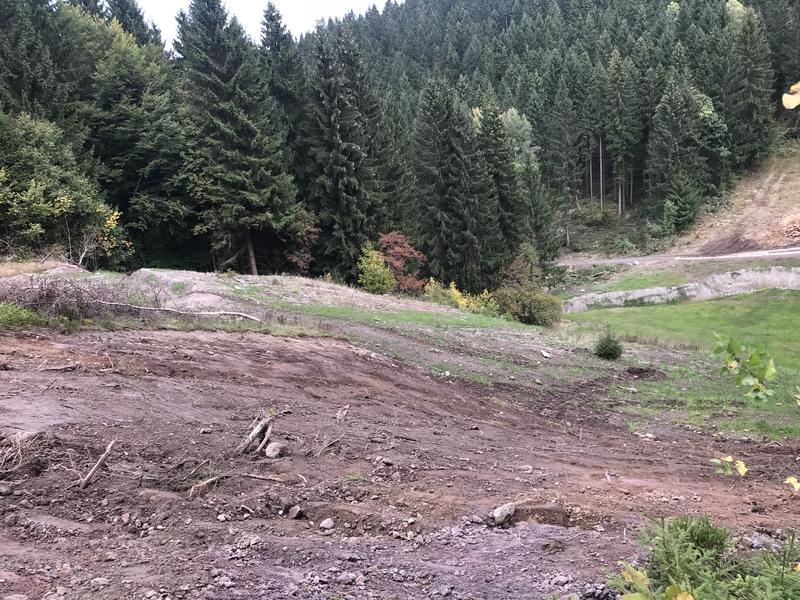 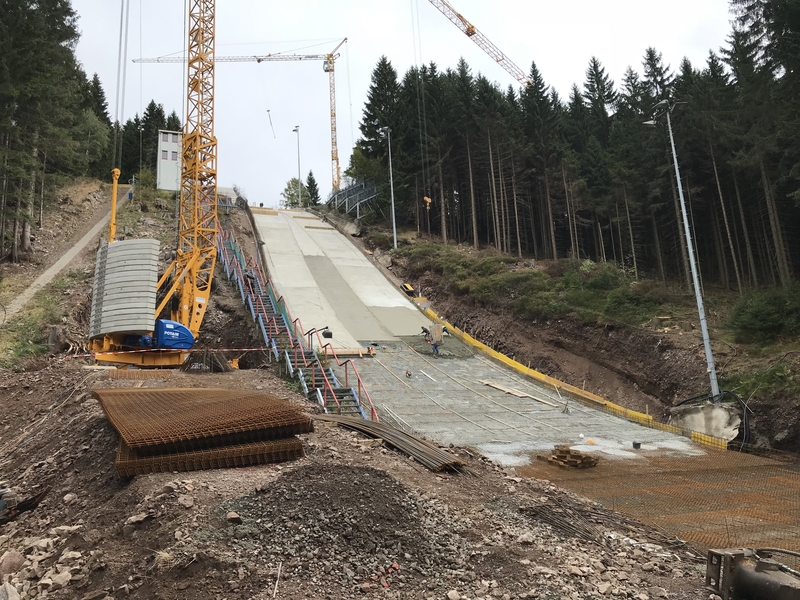 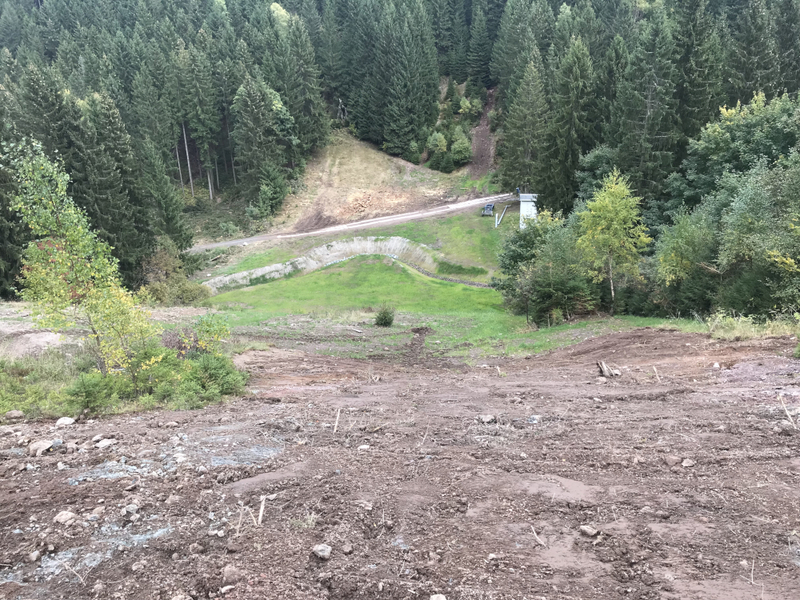 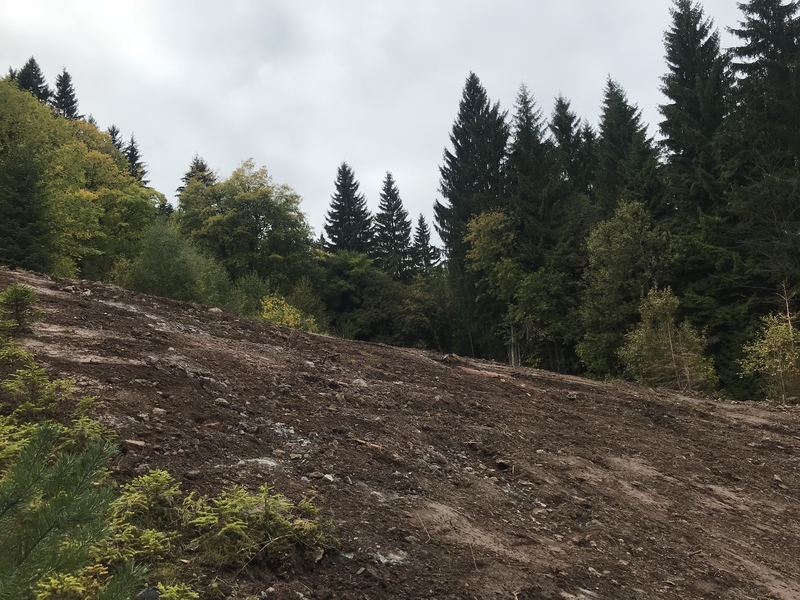 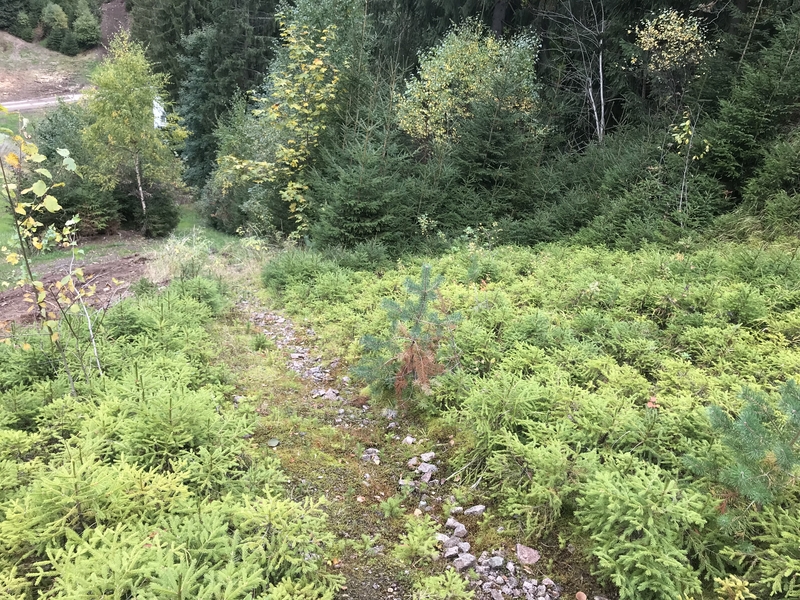 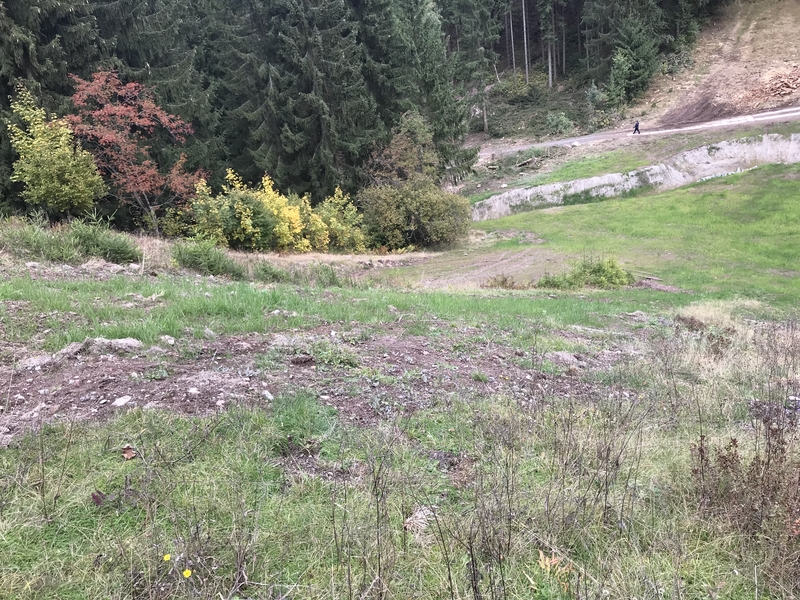 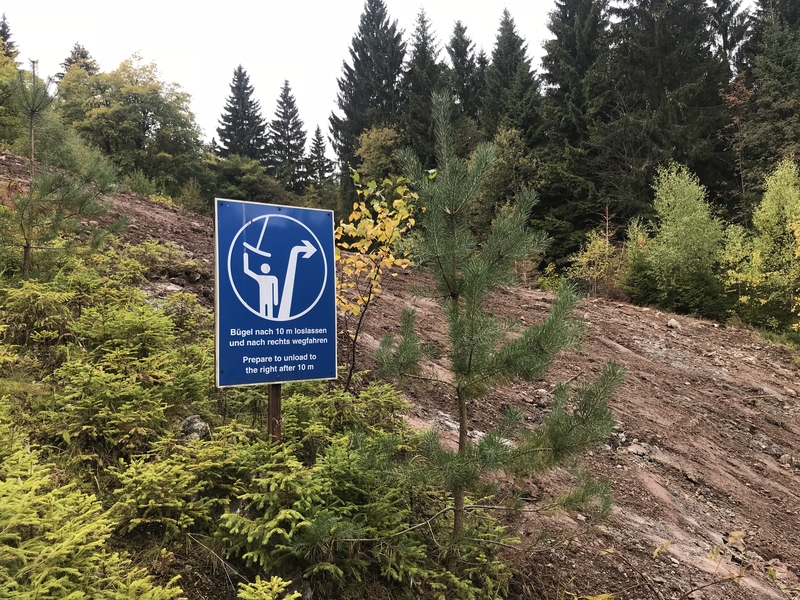 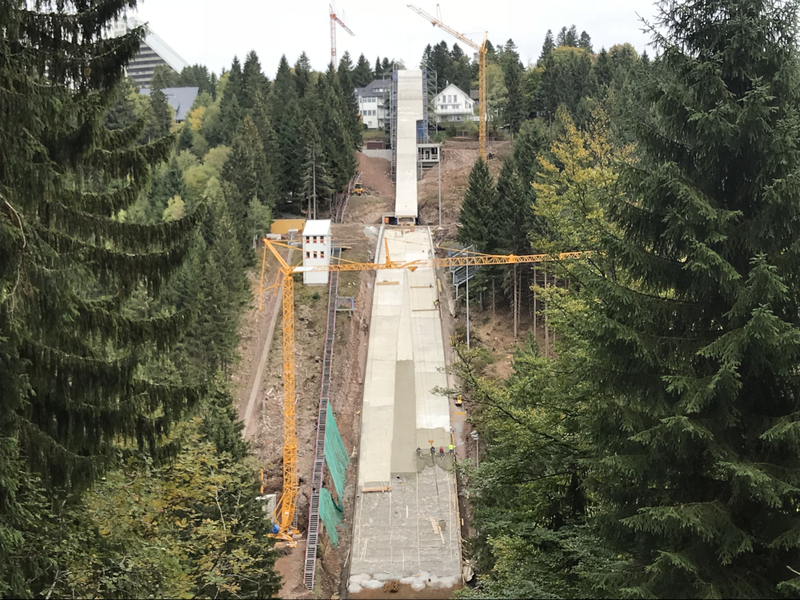 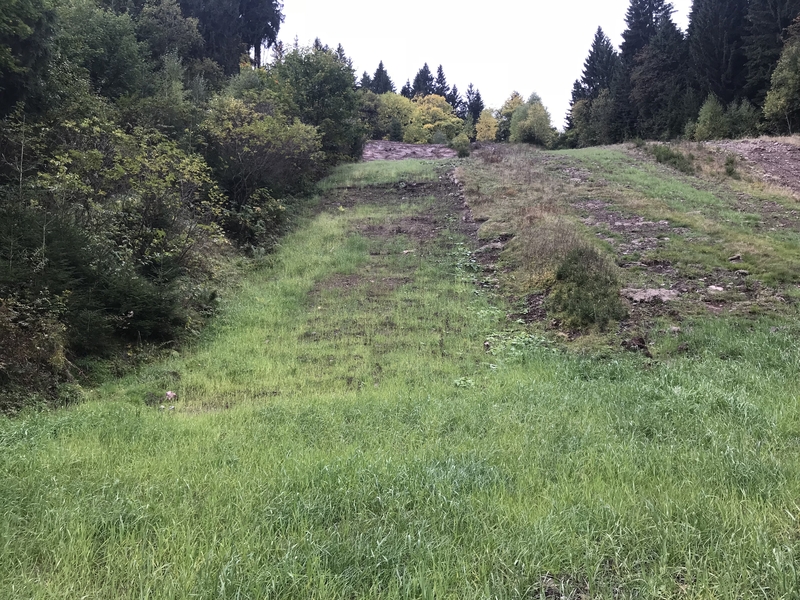 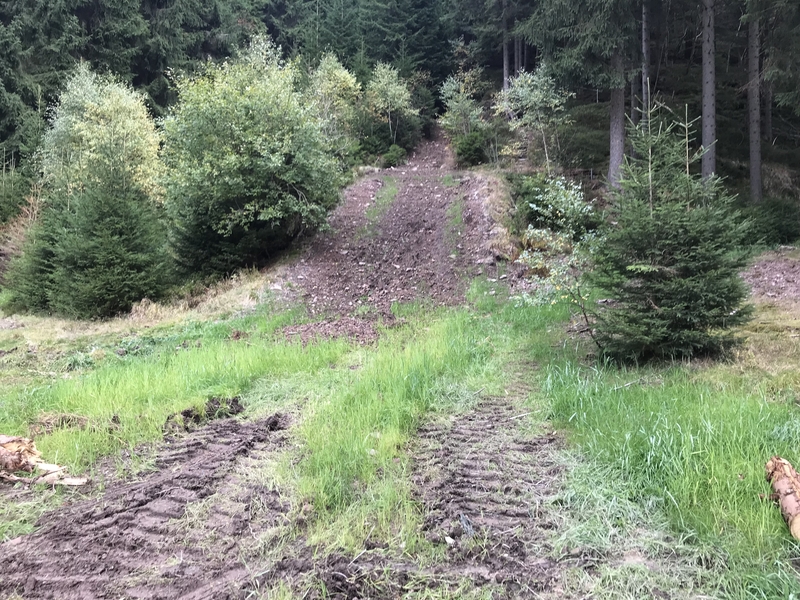 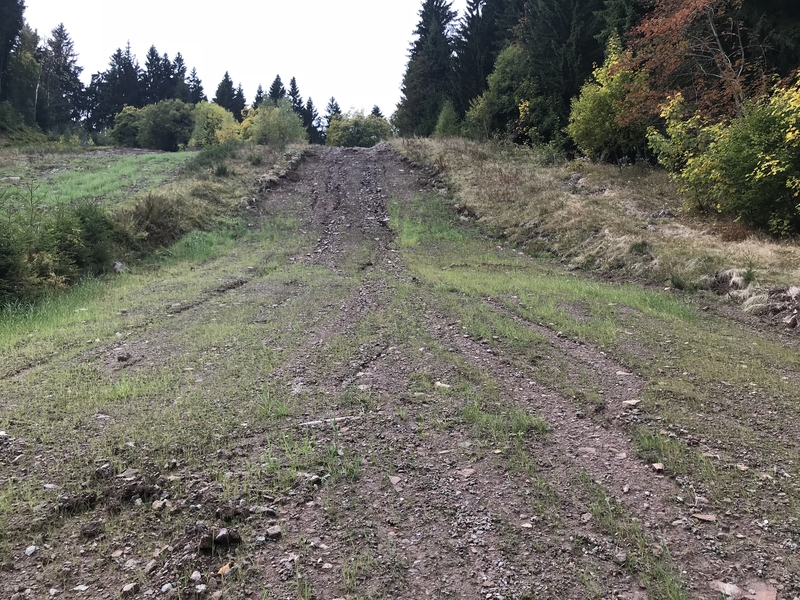 The construction works of this ski jump started in spring 2018 and at the same time the smaller hills have all been demolished. 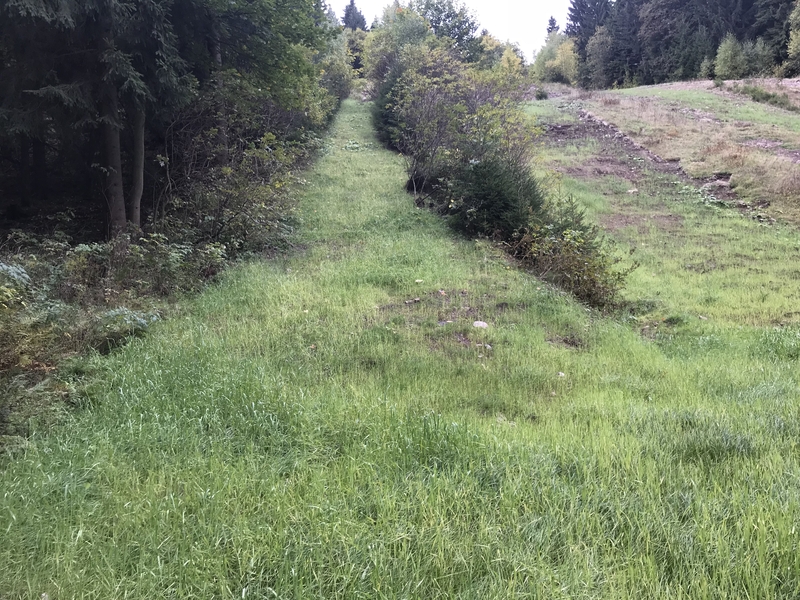 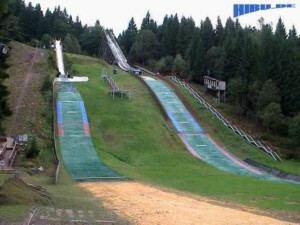 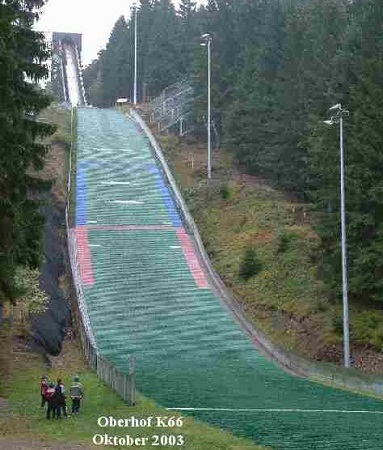 The new medium hill was finally realized as a HS 70 and is supposed to help jumpers moving from the smaller hills to the normal and large hill at Kanzlersgrund. 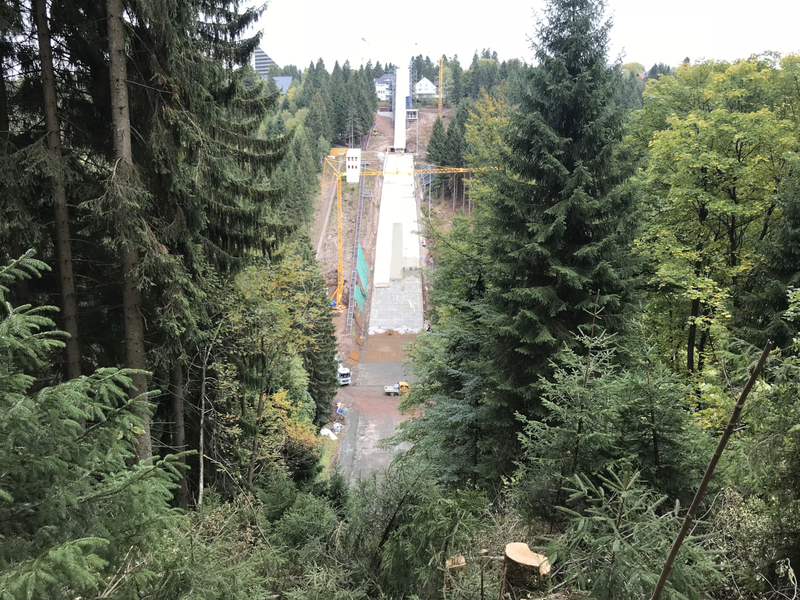 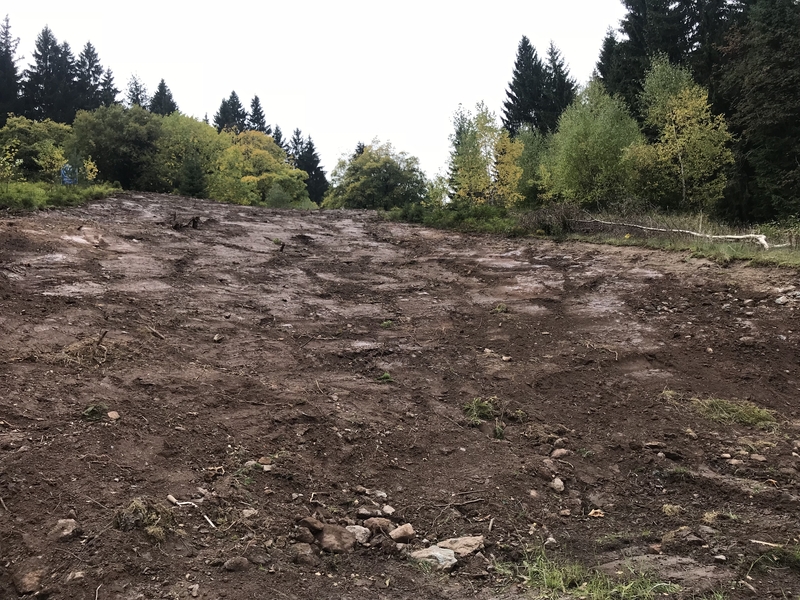 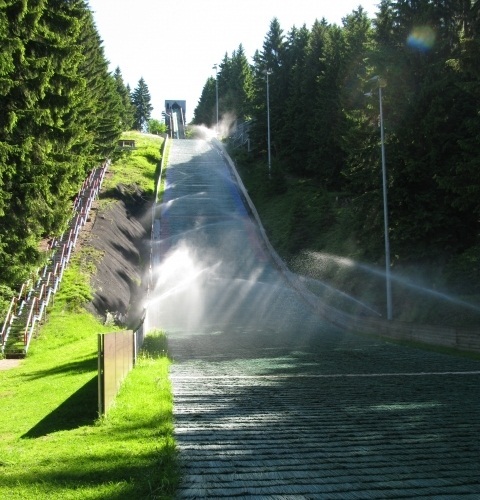 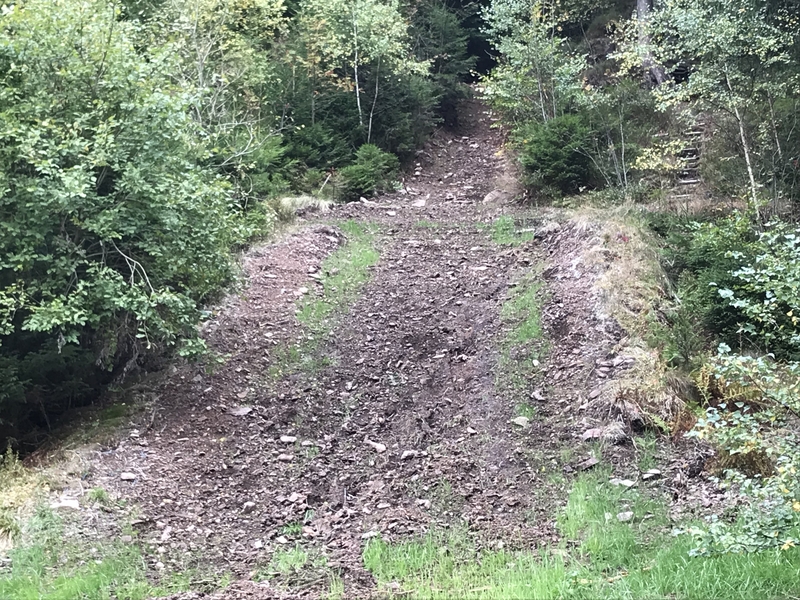 In December 2018 the ultimately 5.5m Euro expensive works have been completed to make the hill ready for winter use and in spring 2019 the plastic covering will be added. 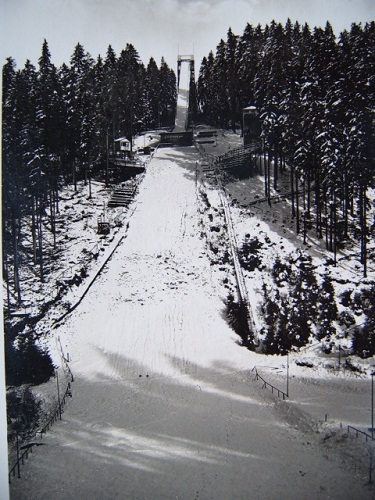 Oberhof is the winter sports centre in Thuringia and was already in times of the GDR the most important place for bringing up young and successful athletes. 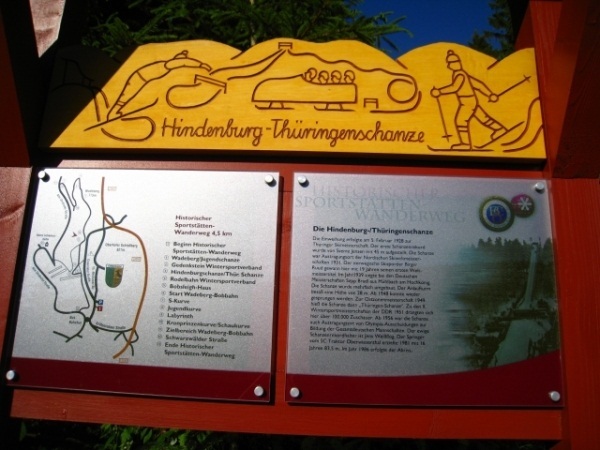 The city has only 2,000 inhabitants and is 25 km south of Gotha. 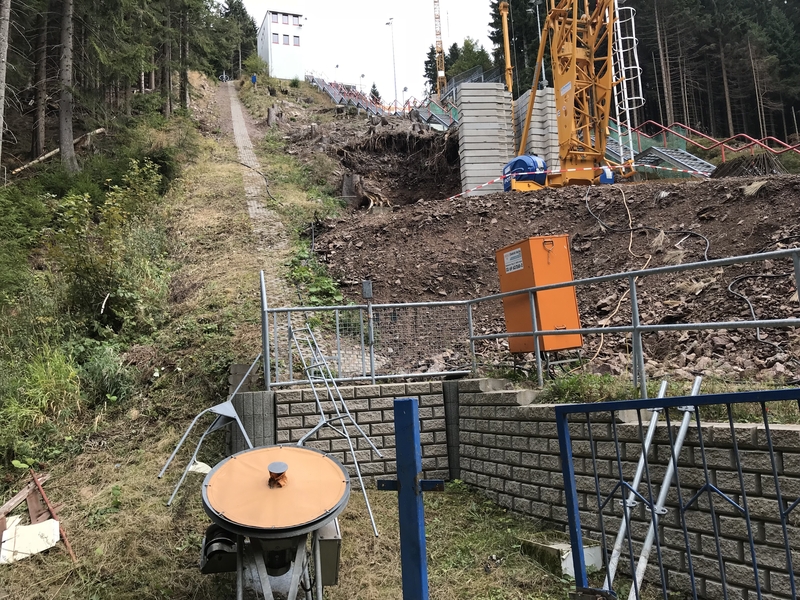 Ich war heute in Oberhof und habe festgestellt, dass auf der K 50 und der K 34 die Matten abgenommen wurden und die Anläufe verwüstet sind. 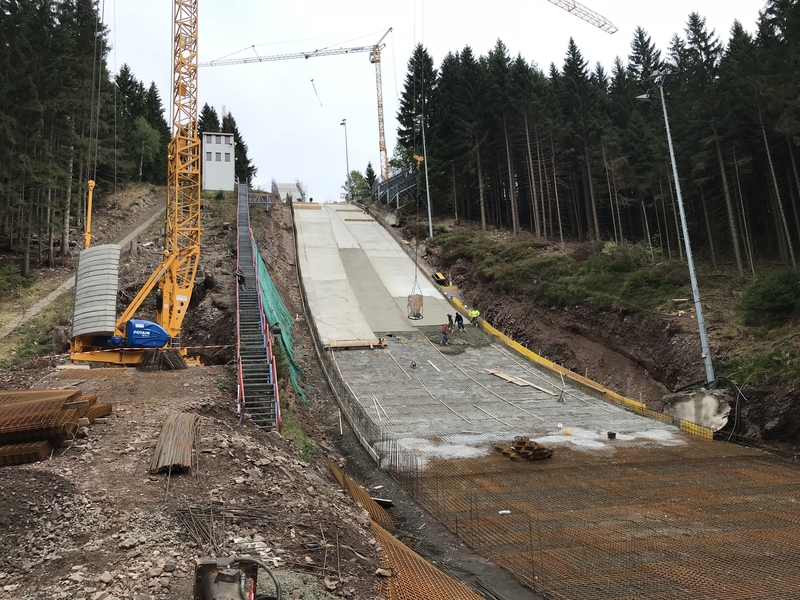 Die HS 13 ist dem Verfall hingegeben... Auf der HS 69 fehlen in unteren Bereich ebenfalls die Matten.